I’ve been trying to gently bug Stella for weeks now about her upcoming birthday. Knowing that she didn’t want to make a big deal of it, and that she might not be up to much with her treatment, I suggested different activities in the Yishuv. I consulted with Yarden. So, on Tuesday morning, having given up on the make-your-own-ceramic night or the Women’s-movie-night or the jewelry-making night, I did what I do when I get desperate. I went to Facebook. And I wrote a message to just a few friends to let them know that Stella’s birthday would be on Thursday and that they probably wouldn’t find out about it. She doesn’t have her own Facebook account (Stella, Stella, Stella) and she wouldn’t be publicizing it. I knew that her friends would want to send an email or call and be able to wish her a great day. And then I left the conversation. When I returned awhile later, I saw that they had brainstormed ideas…they had been chatting among themselves and had come up with something brilliant. Something that would require absolutely no effort on Stella’s part, but that would allow her friends to tell her how much we love her and how much we are thinking of her on her birthday. The person who hatched the idea was so conscientious. She told the excited chatterers that she had to confirm with me that it was a go before springing to action. I knew Stella best, she said, and she wanted to make sure that she would like the idea. And within three hours – three hours! 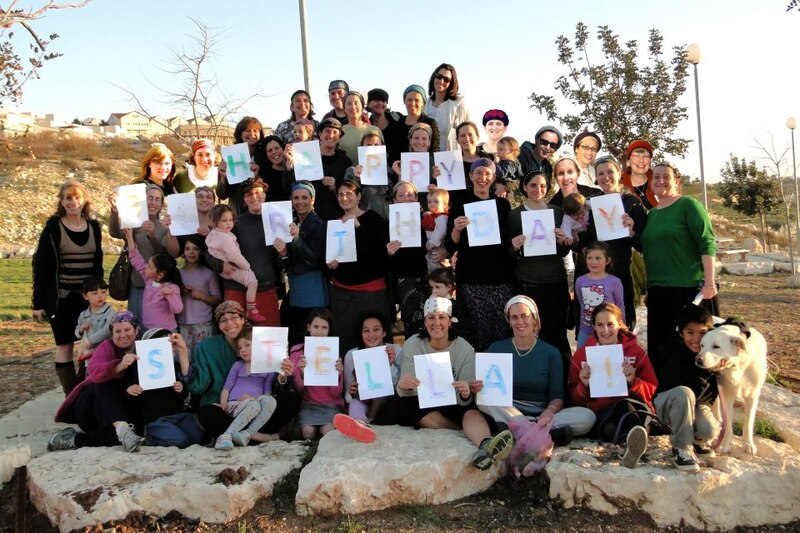 – of hatching the idea, there were 40 or more women converging on a grassy field in the Yishuv. Signs had been made, the photographer (aka Laura) was ready to shoot and discreet phone calls and emails had been sent. Now, obviously, not everyone who wanted to participate was contacted on such short notice, but we did the best we could. And we apologize for anyone who wasn’t included. And there, at 5 pm (a mother’s absolute worst hour), we all raised our letters and yelled, “Happy Birthday Stella” into the lens. And then we giggled and went home. And when Laura put the initial image up for the Facebook group, there were shouts of “But I wasn’t there!” and “Darn, I missed it!” And I jokingly wrote that maybe Laura could just Photoshop those extra faces in. And two days later, on Stella’s birthday, the finished, gorgeous product was hand delivered to the Frankl home. It is amazing to me what people who are full of love are capable of doing on short notice. It is amazing to me what the bonds of friendship can look like. May the picture bring you strength in times of adversity, Stella, and propel you towards health with the love that it exudes. As I keep telling Stella, if only wanting to do help could make everything better, this community would be completely, healthy and happy all the time! What a beautiful tribute. I want to be in this photo! 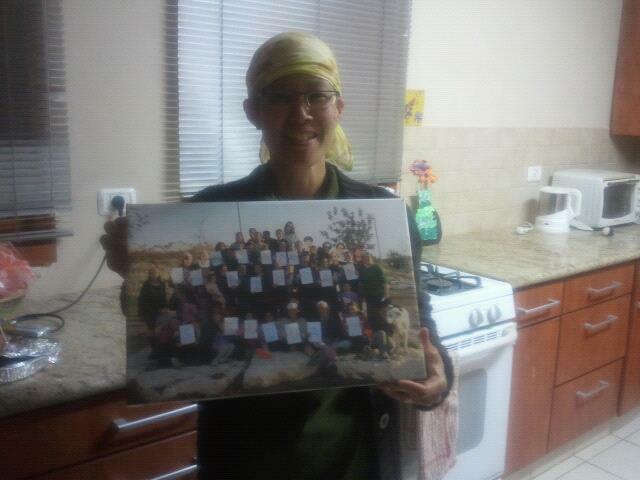 Pulling for Stella from Efrat.